Powered items perform better when they are not overheated. That is true for everything. Daddy used to say "Things don't burn out; they burn up" and he was right. Motors and engines perform best when cool. At box stores we can buy expensive cooling stands for our laptops. For about $5 here is my solution. to me for the website. I am extremely grateful! 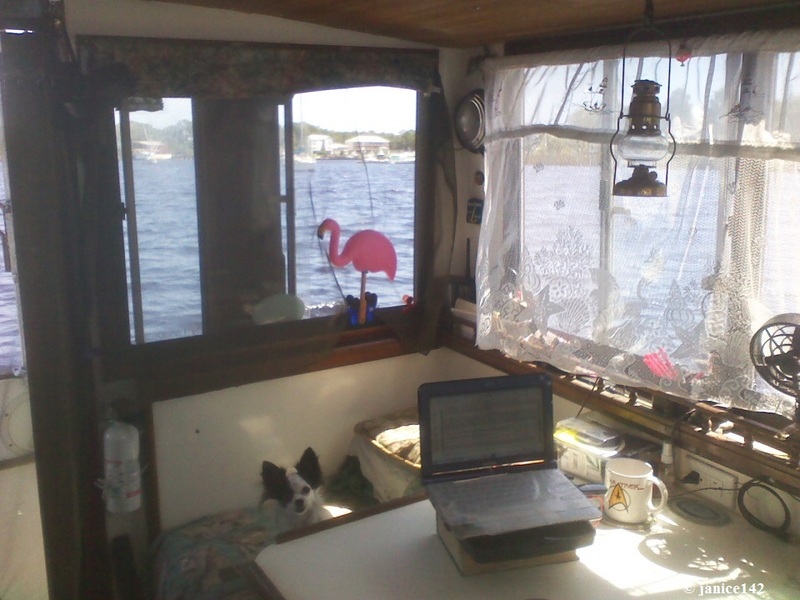 Without a Win7 netbook I could not continue to write/post articles. I am a dinosaur, having used the pro version of FrontPage for over twenty years. That program requires Win7 at most. I truly panic when I think what will happen someday when this netbook gives up the ghost. A secondary advantage is that a netbook uses very little power. My netbook uses less than 2Ah. FIRST COMPUTER MISTAKE MADE: Before I bought Seaweed I had the brilliant idea to buy a 15" Toshiba laptop with a built in DVD player. Oh, I was going to be so cool. I would take the laptop ashore to surf the internet. While aboard I could watch movies all the time. Until reality bit me on the transom. That Toshiba Satellite weighed 7 pounds. Worse yet, it used nearly 7 amps of power per hour. Once I got the 75 watt solar panel generating 25Ah per day... well, you can do the math. I could watch a two hour movie and have enough for the anchor light, MAYBE. Though 7 pounds does not at first sound like a lot, it is. Especially when combined with hauling groceries, water and supplies back to Seaweed. It was physically straining. I only carted the Satellite laptop to shore a couple of times before deciding that was a Bad Idea. So I switched to a much smaller/lighter netbook by Toshiba. I love the netbooks. The problem is they do not have a built-in DVD player. A secondary problem is that I cannot make use of the programs sold to turn DVDs into MP4s. The netbooks do not have a large enough pixel screen size. The copying code won't work with a netbook. My goal was to turn my DVDs into MP4s, storing them on a portable hard-drive. That project is in my To-Do List. 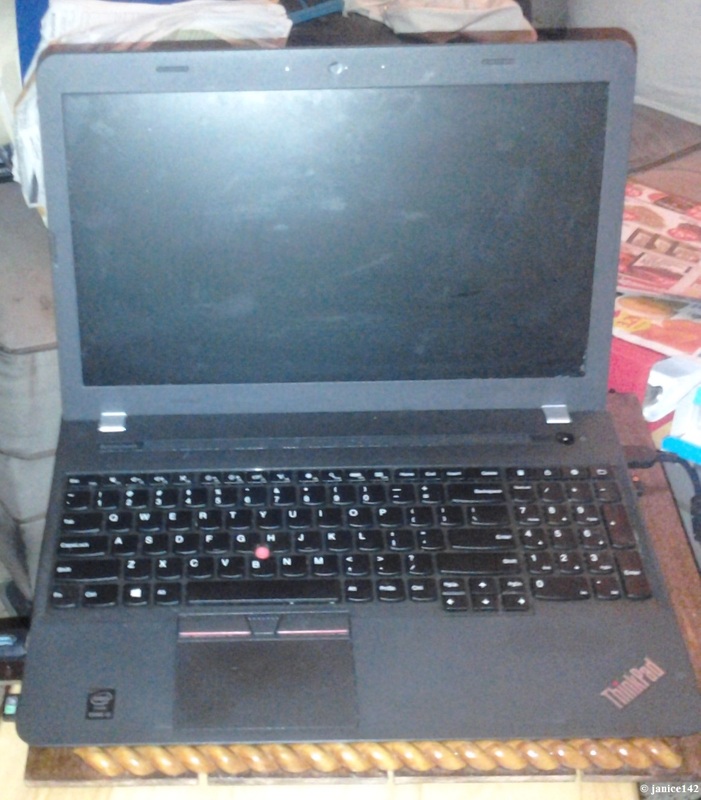 I did buy the portable DVD player and a separate 2T (two terrabyte) hard-drive. The DVD copy project is stalled at present for lack of a computer that can do the copying/digitalizing. There are always projects in the works aboard Seaweed. No boat is ever finished. My list after ten years of life aboard is bigger than when I took ownership. One of the fellows on this canal bought an expensive stand ↓ for his laptop. It broke. Side Note: I showed you how to make this ↑ fold-down desk in the Making a Desk article. Because his computer stand broke I thought I could do better. After all, there's not much to them. What is required is ventilation holes. A solid piece of wood would not allow the vents in the bottom of the laptop to circulate air well. To make a full-sized laptop stand I went to Walmart and bought this for $5. Walmart. 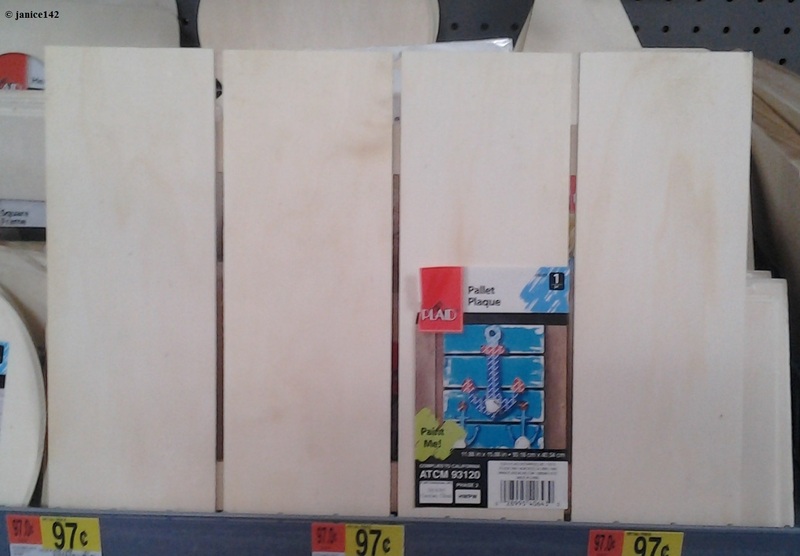 It was located near the floor, midway down an aisle. I had a can of mahogany stain and used it on the stand. A couple coats of polyurethane finished the wood nicely. The support brace is rounded at the bottom and flat on one side. The flat piece is screwed to the stand. I wanted the back higher with the keyboard slanting downward. As for wood, I wanted to raise the back of the laptop stand approximately one inch. That way the computer would sit on an angle just like those fancy store-bought ones. Years ago a fellow had passed along some leftover mahogany from the rails of his boat. He'd switched to stainless from wood. 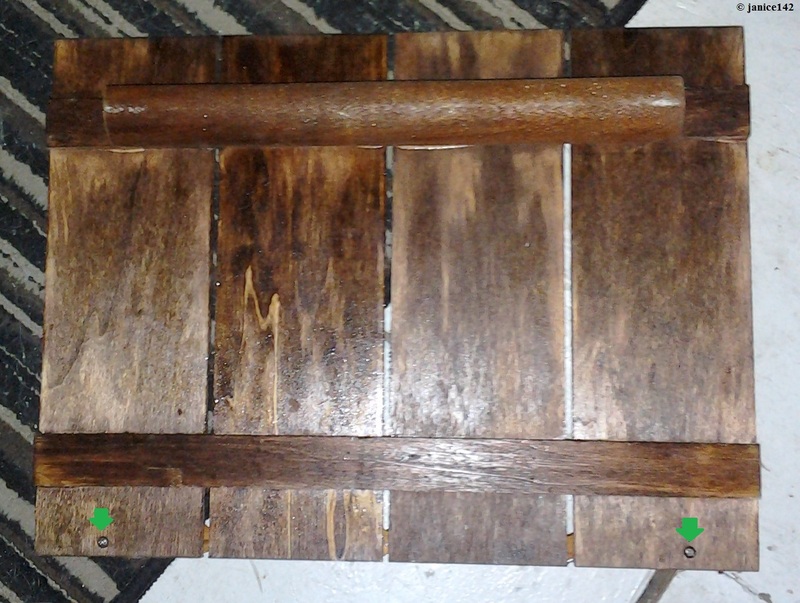 I had a piece that was the proper length so I added a coat of stain to it too. I deliberately did not varnish that mahogany piece. The reason is because I did not want this laptop stand to be too slick. That might allow the item to slide when the boat moves. A slightly rough support brace should provide a bit of traction. ←Picture repeated so you don't have to scroll. If you look carefully you can see two cross pieces across the back of the stand. Those hold the four vertical boards in place. 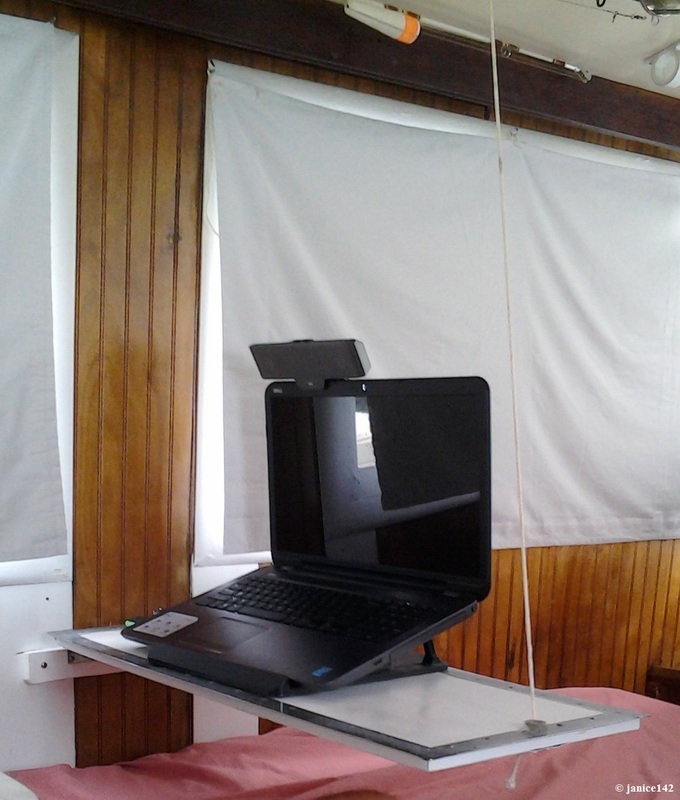 The SCREWS secure the wooden "rope" to the front of the laptop stand. These SCREWS are installed from the back. I predrilled through the stand but not into the wood rope. The rope is made of a soft pine so screws insert easily. I did not want the decorative rope destroyed by the screws. 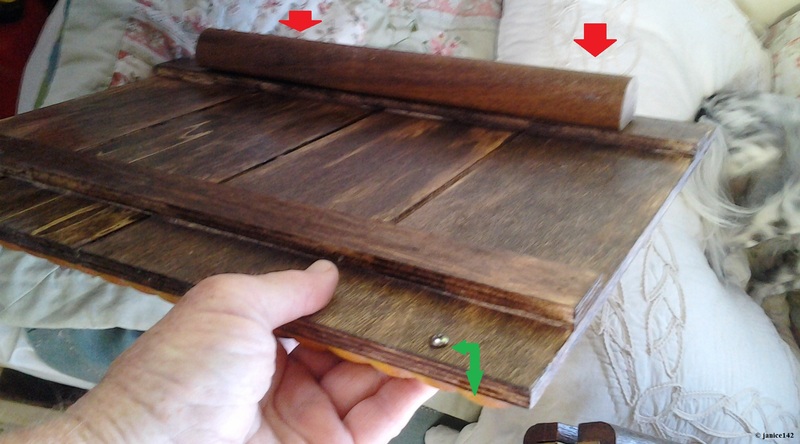 By inserting from the rear it was easier to get a good bite or attachment to the wood rope. Side Note: In retrospect I should have run a bead of wood glue along the back of that rope piece. 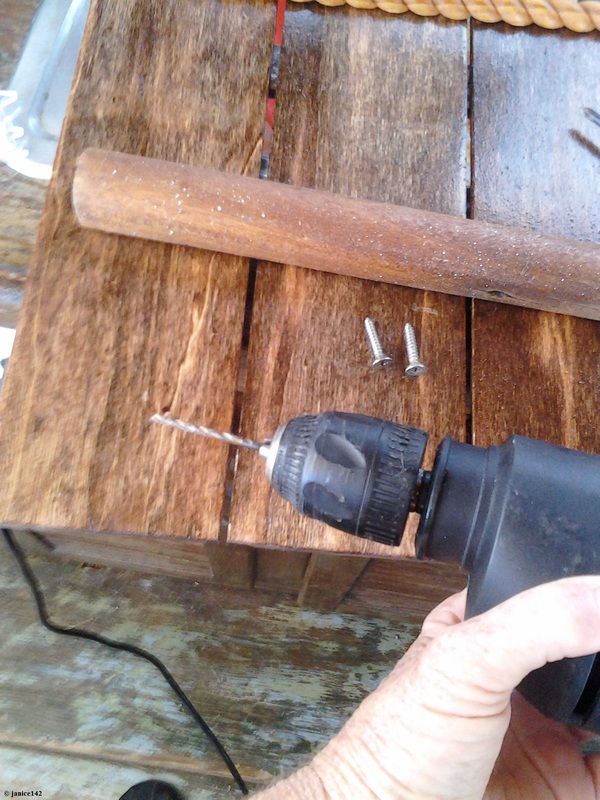 I pre-drilled the holes so the stand would not split when I installed the screws and attached the rope. The cross-piece is such that it will protect the tabletop from the screw head. 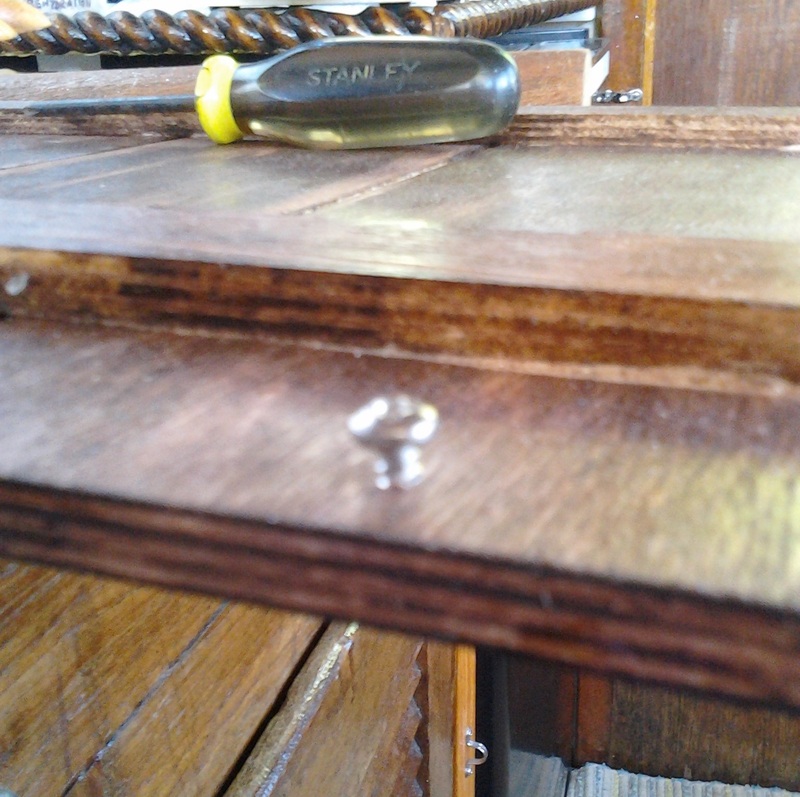 I was of course concerned that the screw might scrape the surface of the table. It is important that the stainless screws not scratch anything. In any project such as this I use stainless hardware. Actually every project done aboard Seaweed uses stainless hardware. If I am doing the work I want it to last. Cheap screws and bolts rust. I always buy a few (four to six) extra screws each time I have a project. Consequently I now have a nice supply of spares in my Ship Stores. The laptop fills the stand. This is a rather large laptop computer. The wooden rope looks nautical. It also prevents the laptop from slipping off the stand. If I were making this for a smaller laptop I might drill a hole outbound near the back of the stand. That hole would serve as a place for an ink pen. 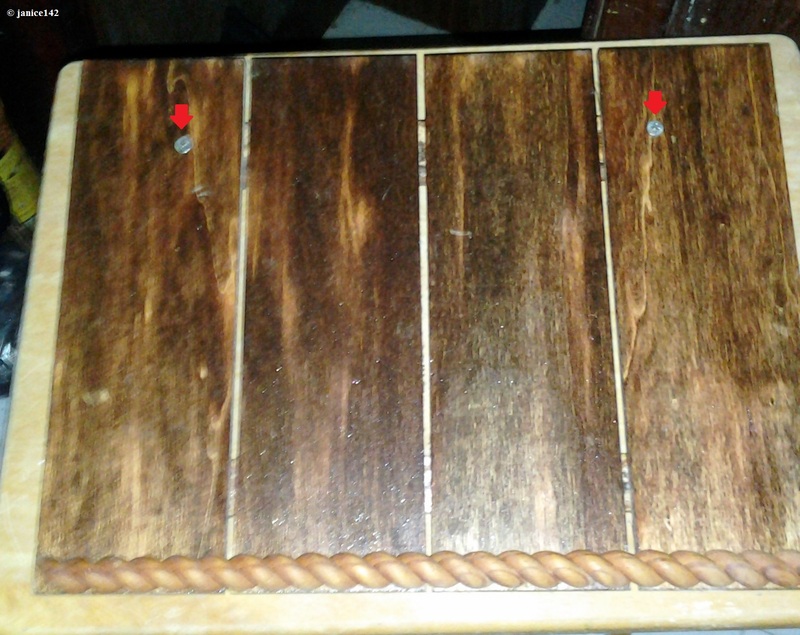 My ROUNDED MAHOGANY BOARD is attached to the top cross-piece. 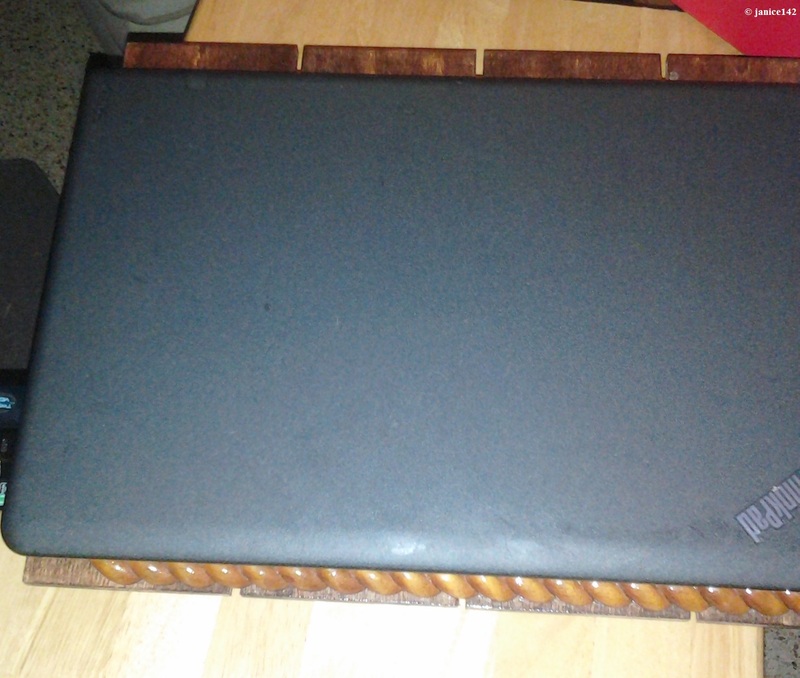 The fancy rope board is ATTACHED FROM THE BACK of the laptop stand. Because the weight of the laptop stand was going to rest on the mahogany lift, it was important the the screws not touch the tabletop. That could damage a desk. Therefore I predrilled holes all the way through the wood laptop stand. Next I found flat screws with tops that would not protrude. They fit flush with the top of the laptop stand. Because the mahogany is a sturdy hardwood I also drilled a smaller diameter hole into it about 1/4". Then when I tightened the screws I could get a good attachment. It worked. Six months later the stand is still a-okay. PREDRILLED HOLES for the mahogany that lifts the stand on an angle. Though not fancy by any means this laptop stand is serving its purpose. The laptop stays cool. As for my netbook, I'm continuing to use the same plastic lid with a chunk of teak across the back. One of these days I may upgrade. For now though, this is a-okay. The view is wonderful too. Aboard Seaweed of late I have been reading a lot. Whenever I go outside the red tide makes my eyes feel scratchy. And too, I admit it is quite pleasant to curl up on my bunk in front of the fan with a nice book on the Paperwhite. truly blessed and wish others happiness too. To you and yours, thanks for reading. Stay well and happy boating. I'd love to hear what you do during the summer heat? Do you have a favorite program to digitalize your DVDs? Which one? A favorite aphorism: Almost anything is easier to get into than out of.